Follow the path of Christ through prayer and devotion to the Blessed Mother with our affordable devotional rosaries. 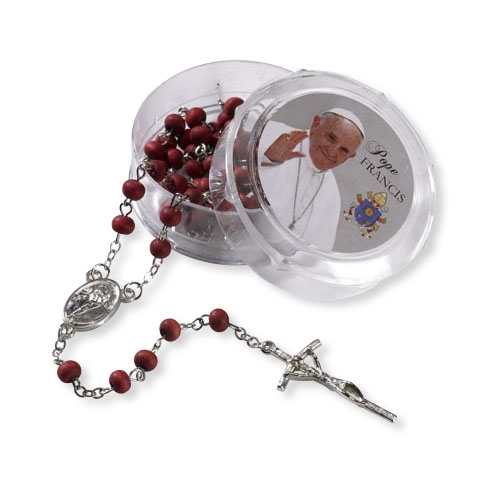 Each Pope Francis rosary comes with a devotional centerpiece and is packed in a convenient, two-piece case with an inspirational prayer on the bottom. These rosaries make perfect, affordable gifts for anyone. O Mary, Mother to whom God entrusted the undoing of the knots in the lives of His children, I entrust into your hands the ribbon of my life. Dear Mother, by your intercessory power with Your Son Jesus, take into your hands today this knot (mention your need), and undo it for the glory of God. Amen.